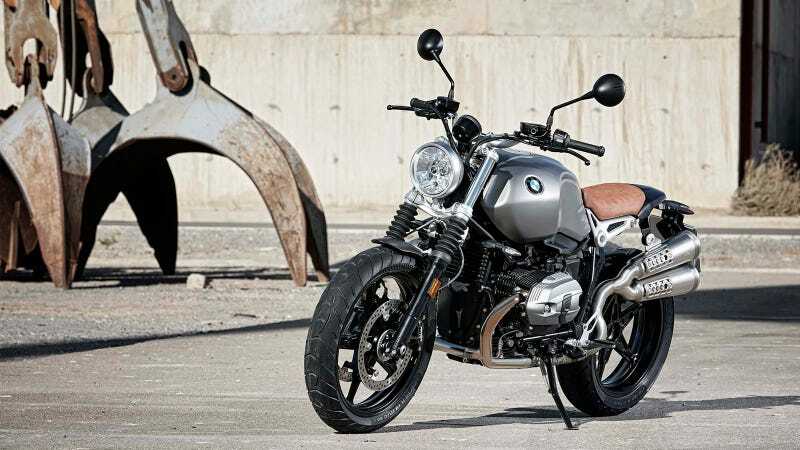 Last week, we broke news that BMW released a scrambler version of their R nineT roadster. They officially uncovered the bike at EICMA in Milan, Italy today and we have more details and a ton of pretty pictures so you can start your day drooling. The BMW R nineT Scrambler, as we intimated, is a lower spec version of the R nineT roadster with which it shares its air-cooled 1,170 cc boxer-twin engine. The R nineT’s motor makes a respectable 110 horsepower at 7,750 RPM and a whopping 85.5 foot-pounds of torque at 6,000 RPM which makes the torque jacking on these bikes unlike anything I’ve ever felt (except maybe the Moto Guzzi Griso). This Scrambler version gets a 19-inch front wheel, deeper treaded tires, and swaps the USD Ohlins from the normal R nineT for a more budget, right-side-up 43 mm front fork which provides 4.92 inches of travel. It also gets a steel tank instead of an aluminum one, higher bars, higher exhaust, a new seat, and pegs that have been moved slightly down and back. Pricing has yet to be released, but expect it to come in less than the R nineT’s $14,990 price tag, and it will only come in the “monolith metallic matte” color shown. As with the R nineT, BMW is launching a massive catalog of accessories so you can “customize” your Scrambler. Looking through the photo gallery is sort of a Where’s Waldo? for custom bits, so make sure you’re paying attention as you scroll through. I feel the need to call out that, at this point, that the term “Scrambler” refers to an aesthetic and not a type of performance. What was once called a “scrambler” would now be called a “dual sport,” so lets stop worrying about how these bikes do in the dirt. This motor is possibly the worst of the current “scramblers” for anything dirty, which matters zero percent since it’s entire purpose is to look pretty and be fun to ride on the street.